Last night team Shiny Shiny went along to an exclusive Spotify event here in London to learn about what the popular music streaming service has planned after its most successful year ever with a whole load of new customers and countries under its belt. We watched a livestreamed keynote speech from Spotify’s CEO and all round nice guy Daniel Ek, in which the Swede introduced a number of new updates that will be coming to the platform over the next few months. 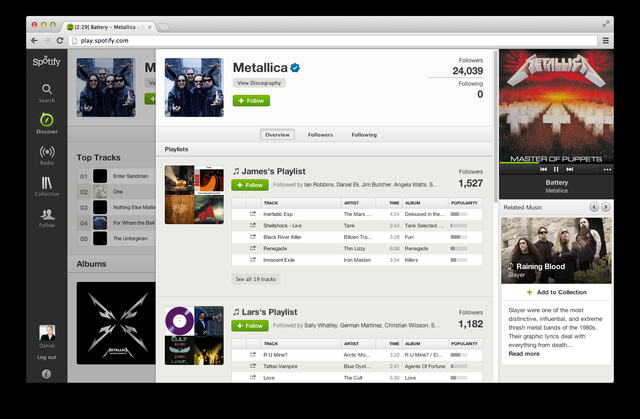 The most exciting one comes in the form of a new “Discover” tab in the desktop version of Spotify, which will suggest new tracks based on all kinds of information about the user. You’ll even be able to see the context at the side, explaining why certain artists and albums have been served up to you. Ek showed us some examples of tracks that were brought up for him to remind him of his youth or other artists that have similar influences to his favourites. There will also be new Twitter-style follow features, which will allow Spotify users to keep tabs on artists, friends and celebrities whose music or taste in music they like. If those people then upload a new track or make a new playlist you’ll receive an automatic update straight to your phone. We’re excited about seeing the updates “in the wild” and will write up a full review once we’ve had a play around with them all.